Retro Friday is a weekly meme hosted here @ Angieville and focuses on reviewing books from the past. This can be an old favorite, and under-the-radar book you think deserves more attention, something woefully out of print, etc. Everyone is welcome to join in at any time! Goodness, I love old covers. What I wouldn't give to own that glorious, garish killer unicorn cover in the middle. It must be the original. I happen to own the cover on the left, with the boy and girl talking on a New York City park bench. I love it so. And it probably gets to the heart of the book best of each of these. 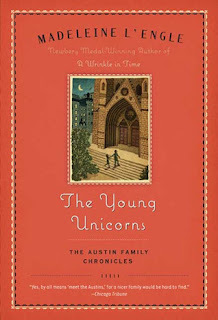 But I adore the Square Fish reissue because it features the cathedral, and I long to have the entire Austin Family Chronicles in those editions as well. I gifted them to my niece not long back, and they are as lovely in person as they are on the screen. So. I am a longtime Madeleine L'Engle devotee. 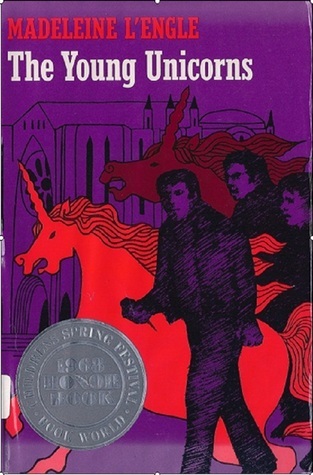 It started back when I was 10 with A Wrinkle in Time and it has stretched out over the years into a lifelong love affair. One of the more treasured and personal ones in my life. And while I love all her worlds, this little series, this family, holds a couple of my most beloved. 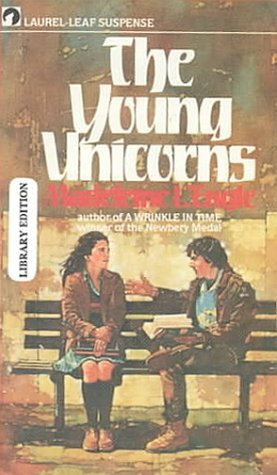 I thought I'd review them both for the next couple of Retro Friday posts, starting with The Young Unicorns. This is actually the third full-length novel in the series, and it's something of a dark sheep, if you will. It's the departure novel, for lack of a better term, the one in which dark things happen and you question whether or not these young characters whom you love will be able to rebound after the fallout. It surprised me when I first read it, coming as it did after the gentler and more staid introductory installments. But the setting, the language, the new characters all wove their spell around me and I always return to it when I am in the mood for whistling in the dark. The Austins have up and moved to New York City. Dr. Austin is working on a research project which requires his residence in the city, and so the family has uprooted itself and settled in Manhattan, not far from the Cathedral of St. John the Divine. It is there that Vicky, Suzy, and Rob meet a young girl named Emily Gregory. Emily is a piano prodigy studying with the brilliant and temperamental Mr. Theotocopulous (Mr. Theo for short). Emily is generally accompanied by an outsider boy named Dave whose job it seems to be to look out for her and be suspicious of things in general. Vicky is sure there's something in Dave's past he's hiding. But the rag-taggle group quickly become fast friends, and the Austins are willing to let Dave tell them his story when he is good and ready. It isn't until Rob, on one of his many rambles through the neighborhood, makes the acquaintance of a genie that danger strikes. This encounter with the genie (complete with magic lamp) leads the children on a journey through the darker underworld of their new home. A gang called the Alphabats dog their heels, with a particular emphasis on Dave. A strange man by the name of Canon Tallis has taken up residence at the Cathedral and appears intent on following the children as well. Everyone's motives are unclear, and soon events are spiraling out of control as the Austins and Co. race to uncover the thread connecting them all. The man in the fur hat left the shadows of the doorway and followed the oddly assorted trio: the dark, shabby boy; the definitely younger and rather elegant girl; and the fair little boy who couldn't have been more than seven or eight years old. They reached the corner and turned down Broadway. The bitter wind whipped a few brown leaves and bits of soiled newspaper across the sidewalk. Strands of Emily's fine, dark hair blew across her face and she pushed it back impatiently. As they passed a shabby little antique shop with a gloomy bit of oddments on the sidewalk in front of the dusty windows, Dave paused. "It was here," Rob said. "Right here." Emily pulled impatiently at Dave's arm, but the older boy stood, looking at the shop window, at the door with the sign PHOOKA'S ANTIQUES, then moved on, more slowly. Shortly before they reached 110th Street the man with the fur hat pulled ahead of them and merged with a group of people clustered about a newsstand. He held a paper so that he could look past it at the children as they came by. The little boy, who had made friends with the crippled man who owned the newsstand, looked up to wave hello. His mouth opened in startled recognition as his eyes met those of their follower. He didn't hear the news vendor call out, "Hi, Robby, what's up?" The man in the fur hat smiled at the small boy, nodded briefly, rolled up his newspaper, and turned back in the direction of the Cathedral. Dave and Emily had gone on ahead. Rob ran after them, calling, "Dave! He's the one!" He tugged at the older boy's sleeve. "Who's what one?" Dave pulled impatiently away from the scarlet mitten. "The man we saw yesterday, the one who talked to Emily!" Rob pointed towards the Cathedral. "Wait!" Dave ran back around the corner. "Emily, he was the one," Rob said. "I'm sorry, but I know he was." "I don't want to talk about it." Emily's face looked pale and old beyond her years. She was just moving into adolescence, but her expression had nothing childlike about it. "It couldn't have been the same one," she whispered. "But it was real," Rob persisted. "It did happen." Dave returned. "I didn't see anybody. Anyway, how do you know he was the one?" "Because he had no eyebrows." Emily gave a shudder that had nothing to do with the cold. What an opener. This book reminds me in many ways of Philip Pullman's Sally Lockhart series. Mysterious. Dark. A sense of impending doom drooping over the whole thing. I eat this stuff up with a spoon. I love The Young Unicorns because it branches out so ambitiously. Dave, Emily, and Mr. Theo burst onto the scene and into the reader's heart without even a by your leave, and the Austins almost take a back seat to their new friends, their new neighborhood, their new life. I love L'Engle's New York City. I love the way she just plops her quiet family down in the middle of a boiling and boisterous city and allows them to explore and be worked upon and changed by its life and color and variety. The cathedral itself is essentially a character in its own right, serving as the perfect backdrop for the secret plots and underhanded machinations that take place within the pages of this story. Ms. L'Engle was writer-in-residence at this very cathedral for many years, and her knowledge of (and love for) its halls and corners and denizens is evident here. To say nothing of the crossover characters with which she graces the tale. Canon Tallis is a particular favorite and one I am always relieved to see show up, both for his keen intelligence and his checkered background. I knew the children would be safer with him at their backs. But things do get decidedly bleak (and a fair bit deranged) before they get better. But if a love of mystery lurks anywhere in your heart, you do not want to pass this one up. L'Engle's lovely words wrap around these precocious children and see them through to the very end. I think I've been in love with Dave ever since I first read this book, and it is his journey that is the most compelling to me. A true standout in the middle of an excellent series. I still need to read the Austin books, but I remember Canon Tallis from some of the later Murray books. Oh, yes. They are simply lovely. Ack, I still feel much guilt for not enjoying A Wrinkle in Time much (hey, maybe if I'd discovered it as a kid, I would have). But, I really need to try me some different L'Engle. So thanks for spotlighting these! I think you'd have more success with this series, Melissa. So very different from AWiT. I think Vicky might be more your speed. I can't believe I never read these! I love Sally Lockhart, so I think I'd enjoy this story. Thanks for this blast from the past; these are totally going in my TBR pile. I'm a bit ashamed to admit my knowledge of her books is severely lacking. I've read one or two, but that's it. Lately, however, I've been getting the urge to go and discover older books and this series sounds wonderful! Yeah, I really recommend this series to people who are newish to L'Engle. It's straight contemporary and the arc and growth across the series is compelling. 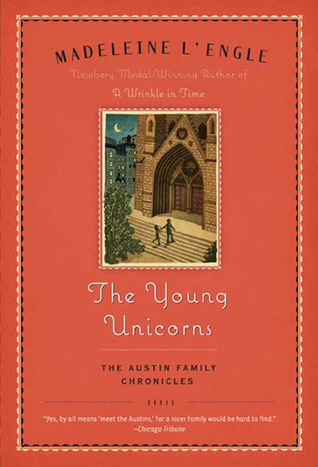 I think I own The Young Unicorns in one of those garish covers, but haven't read it yet, because I frequently fail at doing that. Maybe I'll read this one via audiobook -- I did like the audio of And Both Were Young. Do you? I'd love to see a pic of your copy! I just went through all my L'Engle books and I'm shocked to discover that I don't have this one. No wonder the story didn't sound familiar. I thought I'd read all the Austin books. (My fav was always The Moon By Night. I loved bad boy Zachary as a teenager.) I will have to find this one. Thanks for bringing it to my attention! Oh, gosh. I've never quite gotten over Zachary. His appearance in An Acceptable Time about killed me. My fave Austin waffles between this one and A Ring of Endless Light. But I do love Vicky & Zachary in A Moon by Night! Wow. I've never read this book. I don't know how I could have missed it. I'll check the library for it. It's great, Lin. Very unique even among L'Engle's body of work. I do love this book! And thank you for the cover tour... though I feel I have yet another, 1980s special at home. I'll have to check. Ooh. I'd love to see it! I have a weakness for old covers . . . I love Madeline L'Engle. I also started with The Wrinkle in Time as a child. My husband also loved it and we read it to our kids. One of my daughters has read all of L'Engle's books, too. Thank you so much for this review. I love the Austin family. What a lovely thing, to have shared her books as a family. I'm in the middle of A WIND IN THE DOOR with my son right now.